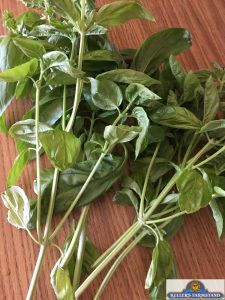 The two best things about growing your own basil are 1) you always have FRESH basil on hand and 2) you can freeze it for future use! Let’s start with harvesting it. When your basil plant starts to flower, pinch them off and discard. That way, the energy in the plant is directed towards growing more leaves. 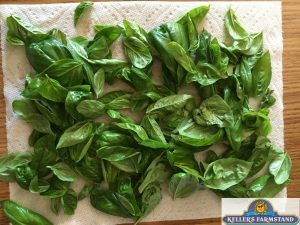 The more often you prune basil, the bushier it will become. Basil plants grow quickly and can become quite large. If you purchased a basil plant from one of our farmstands, you’ll know exactly what we’re talking about! Feel free to trim the plant every 2-3 weeks. 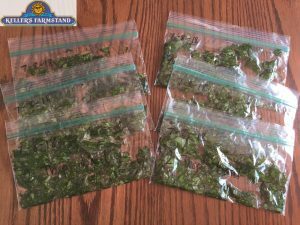 There are many ways to freeze basil. This method works for us so let’s get started! Look for new growth about 3/4 of the way down the plant. 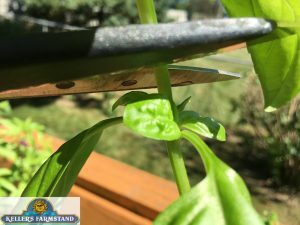 Cut the stalk off right above that new growth with some sturdy scissors. That will encourage the plant to keep on growing. Remove leaves from stalk by pinching or cutting them off. Discard any leaves damaged by insects. 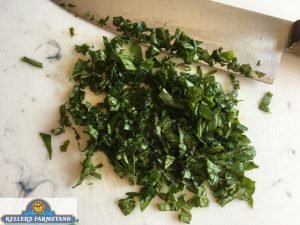 Rinse leaves and place on paper towel. Gently pat dry. Chop leaves as small as you’d like. They naturally start to turn black shortly after chopping. Label snack-sized plastic zipper bags with the date and amount you are placing in bag. Two to three tablespoons works well. 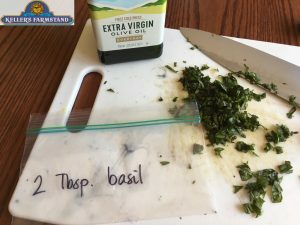 Measure the basil and place inside bag. Drizzle with enough olive oil to slightly coat the basil in the bag.